The Student Ambassador Program aims to put senior student ambassadors in touch with prospective and early degree students throughout the semester. By joining this program you will be able to make new friends and learn more about opportunities available to you as a student. You will be given the opportunity to develop skills such as leadership, communication, public speaking and interpersonal skills. You will be the face of Melbourne Business School, attending orientation events, recruitment evenings, networking opportunities, involved in the creation of marketing and recruitment collateral, and you may even be given the opportunity to travel interstate! 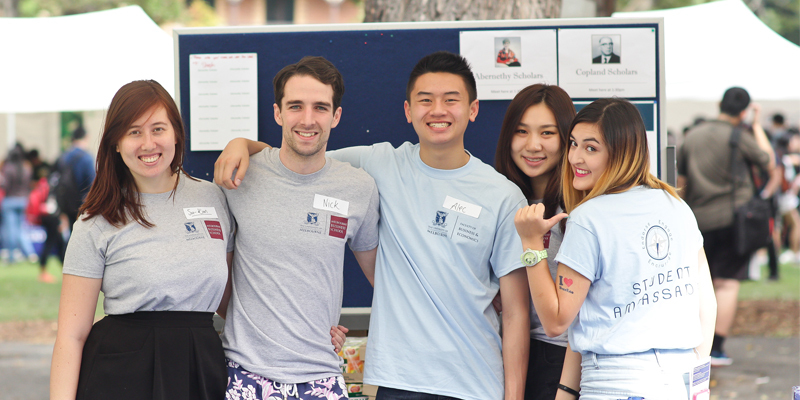 Applications to become a Student Ambassador for Semester 2, 2019 are now open. Participate in photo and video shoots as well as recruitment events as required. The process to become a Student Ambassador involves an online application. Why do you want this position? What characteristics do you possess that make you stand out from the other candidates? Step Two: Submit an application through Careers Online. Applications for the Semester 2, 2019 Student Ambassador Program are now open. Applications close 5pm, Friday 24 May. Melbourne University's Faculty of Business and Economics, in partnership with Global Voices, is offering an exclusive scholarship for a student to represent Australia at the Organisation for Economic Co-operation and Development (OECD) Forum in Paris, from Monday 20 - Thursday 23 May 2019. The successful applicant will participate in the Global Voices Scholarship Program and join youth representatives from around Australia to meet with leaders and experts in policy, economics, health and international development. Applications open Friday 15 February. Attendance at the OECD Forum (20 May - 23 May). The Research Fellowship allows the successful applicant to develop research, analysis and policy-writing skills through developing a policy paper related to the delegation agenda. This policy paper must include specific recommendations for domestic policy application. In addition to travelling to Paris to attend the OECD Forum, all Scholars travel to Canberra to participate in a Pre-Departure Briefings Program. This includes private meetings with policy experts, economists, Commonwealth Departmental Secretaries, Members of Parliament, and civil-society leaders. The scholarship place is fully funded by the Faculty and includes all domestic and international flights, accommodation, breakfasts, visas, insurance, and registration fees. Willing to contribute a minimum of 5 hours per week to Global Voices for the program period (this includes time attending meetings, conference calls and working on your research paper). Applications for the 2019 Global Voices will open Friday 15 February. You are required to submit a research proposal and a personal statement. If successful, your research proposal will become the basis for your final policy paper. Applications without all three pieces of supporting documentation will not be considered. See the Global Voices website for more details on the Statement of Intent and Research Proposal. Quality and relevance of the research proposal submitted with the application. Applications close: Midnight (AEDT) Sunday 17 March, 2019. "Attending the 2016 OECD Forum was a front row seat to important policy discussions, and the opportunity to engage with experts at the top of their field. Over the course of the forum I learned an incredible amount from the intellectually challenging and stimulating discussions I was a part of – ranging from panels on closing the gender gap, the role of the OECD & G20, and the economic outlook for 2016. A personal highlight for me was getting pulled aside by the Australian ambassador to the OECD into a conversation with Karen Wilson, OECD Development Directorate, and whose impact investing reports I had spent the past months reading for my own research paper! The experience has also helped me explore my interest in economic policy as a possible career path, and opened doors to talented people already established in the field. The program is truly an unrivalled opportunity, and has been a defining part of my Melbourne University experience to date!" Click here for more information about the Leaders in Communities Award.